I’ve found over the years that my writing life has ups and downs. Specifically, there are times when I feel like I can climb the literary Everest without one of those sherpa guides, and others I feel like I need to trash-can the whole idea of being a writer. Today, my writer friend Tom reminded me of a time not so long ago, maybe eightteen months or so, when I was dejected and determined writing was a waste of time for me. He reminded me of this at a booksigning sponsored by the northwestern Pennwriters group, where I was surrounded by other writers and would-be writers, discussing my novel The Elf Queen and the sequel, due out next year, and sharing all our writing with each other. There’s a misconception that, in order to be brilliant at something, you need to be blessed with innate remarkable talent. Not so, according to Malcolm Gladwell, author of Outliers: The Story of Success. Gladwell, who studied the most successful musicians, composers, artists and athletes in history, reports that the difference between success and non-success, between genius and mediocrity is 10,000 hours. That’s right. Anyone from Jimi Hendrix to Bill Gates to Hemingway who has succeeded has done so on the back of at least 10,000 hours. Thank you to Tom, Jean, Eric, Jeff, Carm, Ed, Paul and all of you who reassured me that I was on the right track after all, and encouraged me to keep going. Shame on those who felt it was more useful to tear down my work. I’ve got to approach this more philosophically. All the time I’ve put in, writing novels, over the last forty years? Apparently I’ve paid those dues. Now to start on the next 10,000. Back to the word processor!! 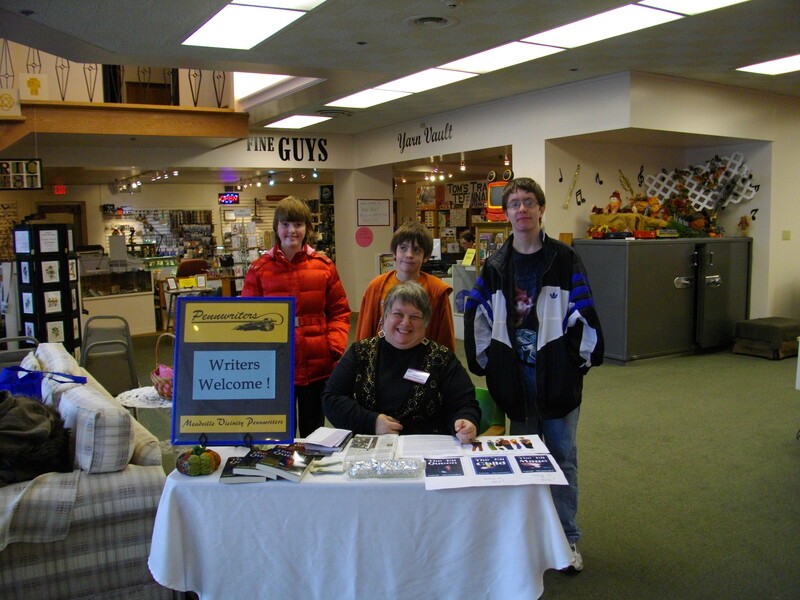 Happy faces at my booksigning--mine, too! There’s a big debate going on over at Pennwriters right now between those who have been published traditionally and those who aren’t about which writers “should” do. The old guard insists that if you want to write novels you must get them to one of the five big houses, get the publicity machine and promotion. Of course this means you have to get an agent. If you’re a writer who has tried to do either, chances are 99 times out of a hundred, it’s just not happening. The old guard then cites the urban legends of authors who just kept sending out until sure as heck, that 101st letter did it. And maybe they did. More power to them. Over the last year, I’ve been reading a lot about the state of publishing, and indeed about the world of communication in general. Time Magazine did a whole series of articles about publication in the digital age, and their conclusion is that the traditional routes are no longer exclusive. But at the same time, newspapers are closing their doors, magazine and book publishers alike laying off staff, and paying markets, in the way we have always thought about them, are drying up. Also at the same time, the whole concept of access to the masses has changed. Once upon a time, you needed to be cherished by Harlequin or Doubleday to even have your book see the light of day, unless you wanted to type out versions on your old Royal typewriter, one at a time, to circulate them. The Internet has changed that game. Now authors have options. They can self-publish through Lulu.com or iUniverse, or epublishers which pay a royalty for books available digitally, or in print books. Writers don’t need the fancy publicity tour, either. Authors like CJ Lyons and Christina Katz, aka Writer Mama, do tours online by guest blogging in as many places as they can. Cost? Your time. The Internet has millions of outlets to reach the people who want your work. Many professional artists are choosing non-traditional routes to promote work they want to do, and it’s starting to make headlines. Musician Jill Sobule found the traditional music business wasn’t working for her–and didn’t get money in her hands– so her latest album was funded entirely by donations from fans, and giveaways. Screenwriters like Joss Whedon are thinking outside the box with projects like Dr. Horrible’s Sing-along Blog, which first appeared on the Internet for free, but only afterward started collecting revenues. Communication venues like Twitter bring the celebrity even closer to fans. Time this week has a story about celebrity Tweeting that shows how Shaquille O’Neal, Levar Burton and John Hodgman all use Twitter to connect directly with regular people. Email and forums bring artists directly to their public, for the kind of one-on-one connection that sells readers, just as it sold Barack Obama to the American people at election time. So we can all dream about that blockbuster sale, movie rights and New York Times listing right out of the gate. We can even work at it around busy lives of work, parenting and other distractions for 40 years. Maybe some of us will get it. But in the meantime, don’t you have something to say? Maybe instead we should be out there exploring the new digital publishing world, meeting our readers, and sharing what we have to offer. As the children trooped dutifully back to school today, I realized some of my very first posts in this blog were about the return to routine and the comforts inherent therein when your family deals with autism. That means I’ve been on this blog journey for a year. Unbelievable. This walkabout has taken me many places, both physical and figurative. We’ve seen all three children make strides forward over the passing days. We sang, we danced–some of us were spinning, more than dancing–we visited new vacation spots and museums. We won ribbons at the fair. We were burgled. We came in dead last betting on March Madness and won some great T-shirts. Ditto Boy saw his school half torn down–the repair’s still not finished. We’ve been evacuated from our home because of deadly gases. We’ve experienced numbered diseases , lost a handful of teeth, and ended up in the emergency room twice. We’ve worked through some rough times and enjoyed wonderful family gatherings . I’ve made a whole group of new friends, people I never would have met if it wasn’t for this vehicle, like daisyfae and birgitte and dee, who watched her Jamaican compatriot reach victory in the Beijing Olympics. I’ve been humbled by other parents of children with autism, whose struggle is more difficult than ours, and I’ve met some adults who don’t consider their autism a disability, but something that sets them apart. I’ve learned from them all. Thank you, friends, for your companionship and your willingness to walk with me along this path, some for a short time, some for longer. I’ve sold some of my writing, and bonded with other writers through their blogs, through my local writer’s groups, through Pennwriters. I’ve placed work with several agents for the first time this year. I’ve become a writer about technology (says the woman who doesn’t even know how to text from a cell phone! ), and taught myself a number of things. The election impacted all of us in one way or another, and I had the opportunity to get personally involved for the first time in years. Yes, even old dogs can experience change! They can apparently teach the new generation a lesson too, as we found with the Women in Black protests. Go Ann! As I review this year and see so many interesting stops on the journey, I’m grateful for this written documentation. I hope some of what I’ve shared has been as helpful to those who’ve read it, as others’ words have been for me, and I’m looking forward to another year together on the trek. As the writer Marcel Proust says,”The real voyage of discovery consists not in seeing new landscapes, but in having new eyes.” Take a fresh look, and really see your world. I participate in two writing groups that are very supportive, both at meeting time and after. One is based in a Unitarian church, and the small group is well-meaning and cheerful, though the members aren’t regularly published; it’s mostly people who like to write for themselves. The other is part of the larger Pennwriters group that’s branched off to meet in Erie, and is made up of people who are professionally farther along, and mostly published writers. I’ve been meeting with this group for maybe five years–they were a group before I came along. We know each other’s strengths and weaknesses and we can evaluate new projects in light of these. Some write and improve the same pieces over and over to bring for critique, working toward perfection; others, like me, tend to work in mass quantities. So….with the patient understanding of the Cabana Boy and children, who all know I’m a better person when I’m involved in creation, it looks like I’m on track for the chemical-free rush of NaNoWriMo. Well, except for the caffeine. LOTs and LOTS of caffeine…. If you’d like to see a great assortment of pieces on and about writers, come on down to the Just Write Blog Carnival where you’ll find much to interest you, including a piece of mine!